Do you like brunch? I know I do! I usually don't eat first thing right after I wake up, so it's usually late morning/early afternoon before my belly starts rumbling. I'm more inclined to use the stove later in the day to enjoy a hot meal instead of just grabbing a bowl of cereal or a bagel to satisfy my growling tummy. I'm a potato girl and could eat them for every meal, but with my arthritis, I don't always have the desire to fight through the pain of peeling and dicing them for my meals. Because of that, I have been a huge fan of Simply Potatoes® pre-washed, peeled, and diced potatoes for the past few years. Some of you may remember my yummy Maple Glazed Roasted Vegetables that I made with their sweet potatoes last fall. Because they go from farm to fridge to fork, getting a hot serving of potatoes is as simple is opening up my fridge and pulling out a bag of Simply Potatoes, then popping them in the oven or heating them up in a skillet. No prep and no mess = one happy girl! While I do use Simply Potatoes for dinner often, I do like to break them out on the weekends for brunch with the family. 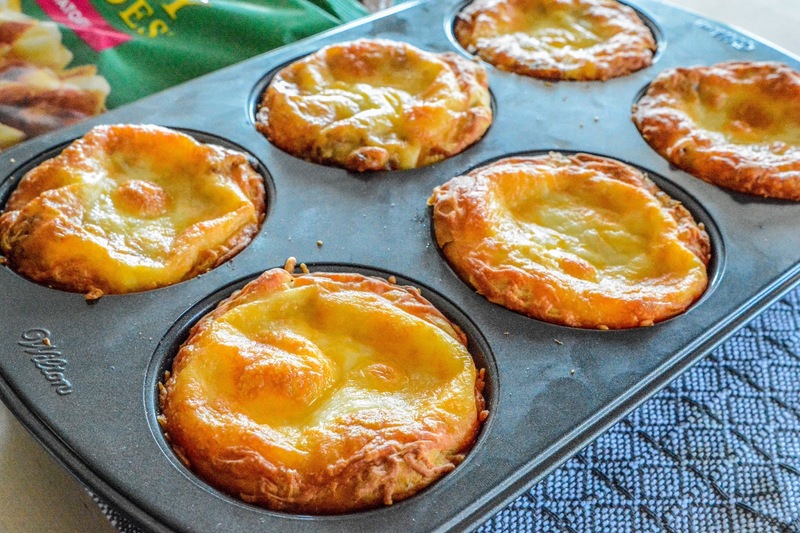 They are awesome in casseroles, but over the weekend I did something a little different and made us some Cheesy Breakfast Biscuit Cups. These can be made in a standard 12 cavity muffin pan, but I like to use the extra big 6 cavity muffin pans with this recipe because you get a lot more filling to enjoy with each biscuit. Preheat oven to 375 degrees F. Cook bacon according to package directions. Drain and crumble. Heat a skillet over medium heat. Combine flour, salt, and pepper; add to pan. Add 3/4 cup of milk and continuously stir for 2 minutes, or until thickened. Remove from heat, stir in bacon crumbles, then set aside. In a separate skillet, melt butter over medium-high heat. Add potatoes and occasionally stir until potatoes are tender and have turned golden brown. While potatoes are cooking, whisk together the eggs, garlic salt, + 1 tbsp milk. Pour mixture over the golden potatoes and stir just until set. Remove from heat. Press biscuit dough into the bottoms and up the sides of a muffin tin cavities. Place a heaping spoonful of the potato mixture onto the dough. Next, place a tsp of grated cheese over the potato layer, followed by 1 tsp of the bacon mixture. Top with 1 more tsp cheese shreds. Repeat until 8 small or 6 large muffin cavities are filled. Bake in the preheated oven for 20 minutes, or until biscuits are golden brown. Remove from oven and serve immediately. I did use the diced potatoes here, but you could mix this recipe up and use their shredded hash browns or sweet potatoes to keep things interesting. Switch up the filling to suit your fancy as well. Maybe add in some diced onion, peppers, or sausage. Any way you fill it, these biscuits are amazing! You can find Simply Potatoes in the refrigerated section at your local grocers. 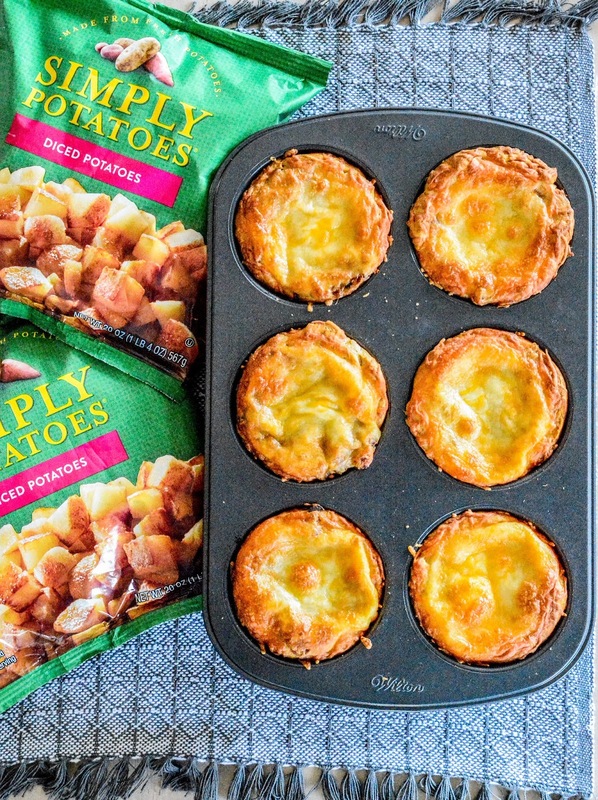 Be sure to visit the Simply Potatoes website for more tasty recipes! 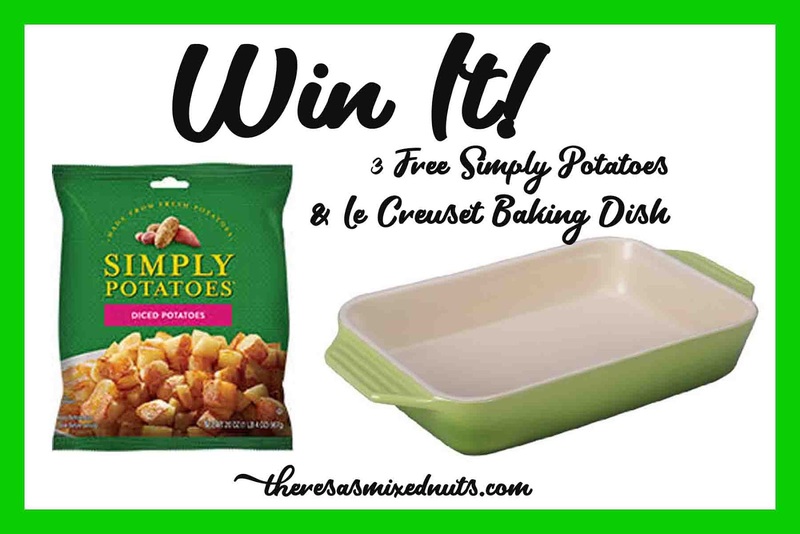 One Lucky Theresa's Mixed Nuts Reader is going to win 3 Free Coupons for Simply Potatoes® + a Le Creuset Stoneware Rectangular Baking Dish (12.5 inch x 8.25 inch). This giveaway has a retail value of more than $50! The giveaway is open to residents of the U.S., 18+ and ends 3/22/18. Winner will have 24 hours to respond to winning email before a new winner is selected. - Be sure to include an email address with your comment so I can contact you if you are the winner, otherwise I will have to choose a new winner. WINNER HAS BEEN SELECTED! There were 209 valid entries before the close of the giveaway. I used a random number generator and #75 was selected (Athena). Thanks to everyone who participated and Congrats to Athena on the win! Whaaat? I thought Jason has arthritis! These look soooo nom! Lovely arrangement in photos! Who does not like potatoes in all shapes and meals :) Admittedly I once haven't eaten them for two years, for reasons unknown. These days I mostly eat them in salads with mayo. His doctor thought carpel tunnel or arthritis. They sent him in for scans and they came back saying nothing is wrong. The pain in his hands is just from him getting old, bwhahaha! Me, on the other hand, have all sorts of joint pains from my illness :( Especially when the weather changes. Now that we are about to roll into spring, these rainy days are super brutal on my joints. We do love potatoes in any form we can get them! Morning, noon, or night, gimme gimme gimme! OMG you will need minions to work around the house in a few years :) Better save that money from travelling to buy a well trained monkey that can wash dishes and peel potatoes! Sounds like they do the trick so you can have your brunch with little hassle. But doesn't eating brunch make lunch and supper later? Yes, it does but sometimes I don't get in until after 8pm, so those days I eat brunch and dinner. Just two meals instead of 3. The Mashed Potato Puffs recipe looks divine! Every time I go to buy them, they are almost gone as well. People do love them! I like the cheddar and bacon potato salad. We barbecue a lot in the summer and potato salad is one of our favorite side dishes. Crunchy topped cheese hashbrowns - yummy! Although, all of them look amazing!! 30-minute Irish skillet is my favorite recipe from the website! lifesdeepcolors at hotmail dottt com. I am loving the Crunchy Topped Cheese Hash Browns! They look amazingly delicious! I would love to try the Crunchy Topped Cheese Hash Browns. I like the Mexican Potato Sausage Casserole recipe. Thanks. the cheesy hash brown cups look good. #10. Please reply to this with your email so I can contact you if you are chosen the winner. I would like to try the Cheese Hash Browns recipe. Cheddar & Bacon Potato Salad looks very good to me. #15 Please reply to this with your email so I can contact you if you are selected the winner. I like the CHEESY HASH BROWN SKILLET DINNER. #16 Please reply to this with your email so I can contact you if you are selected the winner. #18 Please reply to this with your email so I can contact you if you are selected the winner. I like the Cheesy Hashbrown Skillet dinner. It takes only 30 minutes to prepare! I like the crunchy topped cheese hashbrowns. #20 Please reply to this with your email so I can contact you if you are selected the winner. 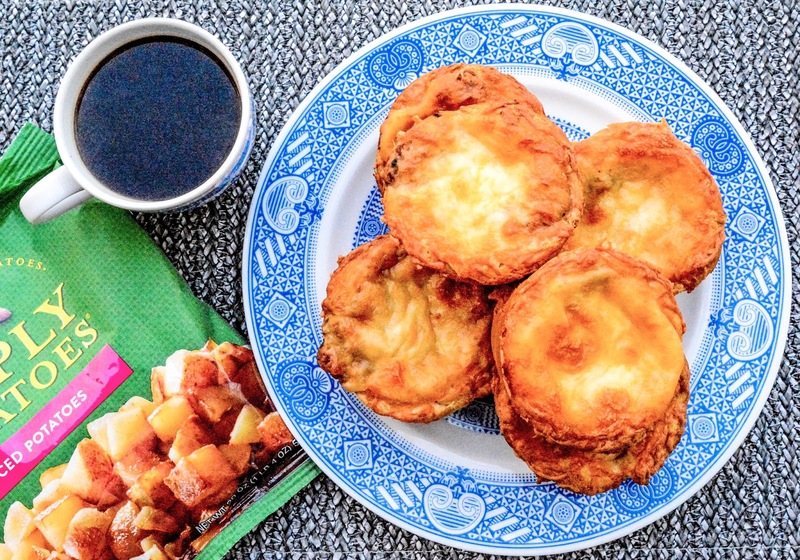 The Potato Latke recipe looks super easy. I hate having to shred a pile of potatoes by hand -- it's messy and someone ALWAYS skins their knuckles. #21 Please reply to this with your email so I can contact you if you are selected the winner. I love hash browns with onions, cheese, and sausage. My favorite dish is the cheesy potatoes. #25 Please reply to this with your email so I can contact you if you are chosen the winner. I am eager to try the Spinach and Goat Cheese Hash Brown Nests! I am salivating over that recipe. :-) Thank you. Crunchy topped cheese hashbrowns sounds amazing! Thank you!!! Cheesy Hasbro skillet is the winner. #39 Please reply to this with your email so I can contact you if you are selected the winner. My favorite dish would be the Ham and Cheese Stuffed Hash Brown Balls. Yum... Sounds delicious! The Irish potato pancakes look yummy! #45 Please reply to this with your email so I can contact you if you are selected the winner. There's something about roasted potato and bacon that's very comforting to me.. I love this simple recipe that you can use to make any kind of mini pies, not just with the potatoes! I know! It's a good combination, right!? Like the mashed potato puffs recipe. #46 Please reply to this with your email so I can contact you if you are selected the winner. I think I would like to try the Creamy Chicken Vegetable Potato Topped Casserole...it looks delish and so hearty! The hearty breakfast skillet sounds like something everyone would eat! I like the Cheesy Bacon and Potatoes Casserole recipe. They could use some more vegetarian recipes on their site, I kept clicking on stuff and then it'd randomly have beef or sausage in it. I think I'd make the Cheesy Italian Roasted Potatoes because they remind me of something my mom used to make. I want to try the Mashed Potato Puffs recipe. It sounds wonderful. The Cheese Hash Browns sounds delicious to me. I love the look of the crunch topped cheese hash browns. there is nothing like cheese and potatoes. I have never tried making this, but I'd love to attempt it, the Vegetable Latke Piccata looks just scrumptious! I would love to try out the Irish potato pancakes. Breakfast egg rolls looks very good. I like the sound of the Chessy Bacon and Potatoes Casserole. Sounds delicious. My favorite is the Cheddar and Bacon Potato Salad. Sounds yummy. I like the sound of the Crunchy Topped Cheese Hash Browns. yum yum! The simply Au Gratin potatoes dish is my favorite. My favorite dish are the Cheesy Hash Brown Cups. They look so fun and delicious!! I would love to try the cheesy hash browns recipe it looks yummy! Cheesy Potatoes is the recipe that I like the best. The cheesy potatoes looks good! Would love to try the cheesey hash browns! I love love love hash browns. the ham and cheese stuffed hash brown balls sound really good. I would like to try the 10-INGREDIENT HASH BROWN TACO SKILLET. Cheesy potatoes. I like ingredients as close to their natural form as possible. My favorite from this website would be Cheesy Bacon and Potatoes Casserole. HASH BROWN AND CHEESE STEAK CASSEROLE looks divine. YUMMY! I think the Mexican Potato Sausage Casserole sounds yummy. The cheesy hash brown skillet is my favorite!!! I would so love the Candied Bacon Roasted Sweet Potatoes..They look delicious! The cheesy hash brown skillet dinner is amazing sounding. Can not wait to have it. Cheesy Bacon and Potatoes Casserole. The Sweet Potato and Wild Rice Salad is unexpected but looks good! Email ssremington (at) gmail dot com. The Crunchy Topped Cheese Hash Browns sounds amazing! My favorite is the ham and potato Gouda puffs. So delicious. Potatoes are my favorite food! I want to try making the South of the Border Hash Brown Bake. they sound like a great veggie alternative. I most definitely would love to try the cheddar and bacon potato salad recipe! Thanks so much for the chances to win. I like the crunchy topped cheesy potatoes. I like to have the texture of crunch, but cooking potatoes to a crunch isn't always healthy, so this is a healthy alternative. Breakfast Egg Rolls is my recipe of choice! The cheesy hashbrowns sound delicious. We love using potatoes in our loaded potato and chicken casserole.